I love sports. I also love being with my family. I enjoy computers a lot and I am always on them. I am a pretty well rounded and laid back person, and love to chill. bdehaakmsn has written 4 articles so far, you can find them below. 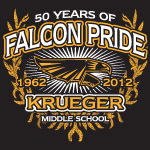 Krueger Falcons, It’s fundraising time again! This time we are selling something different: lots of food and other odds and ends. This fundraiser is specifically for Orchestra and Theater Arts. Learn more about our Fall Fundraiser!